While paying tributes to Dr Lohia on Friday, Mulayam asked Lohia’s followers to oppose injustice at every level. LUCKNOW: The political landscape of UP is changing rapidly. A day after remaining conspicuous by his absence at an event organised by Samajwadi Party (SP) chief Akhilesh Yadav, party patriarch Mulayam Singh Yadav was seen sharing the stage with his rebellious younger brother Shivpal Yadav while paying tributes to SP ideologue Dr Ram Manohar Lohia on his death anniversary at Lohia Trust here on Friday. 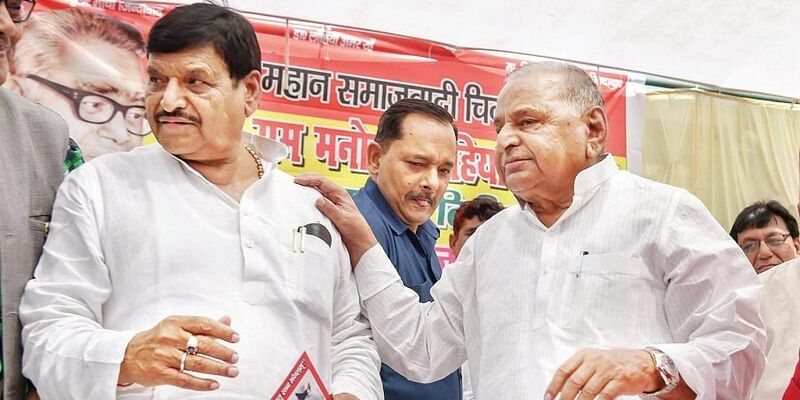 This is the first time that Mulayam shared the stage with Shivpal since the latter floated Samajwadi Secular Morcha. Mulayam is the president of the Lohia Trust while Shivpal is its secretary. While paying tributes to Dr Lohia on Friday, Mulayam asked Lohia’s followers to oppose injustice at every level. “In case elder brother metes out injustice to the younger one, it should be opposed in every form, be it in the family or the party. This was the philosophy of Lohia and I believe in it,” he said. He, however, refrained from elaborating further. On the other hand, an upbeat Shivpal once again claimed that he had the blessings of ‘Netaji.’ “Today Netaji has graced us with his presence and gave his blessings and I am sure he will continue to give us his blessings in the future also,” he said. After the event, while interacting with the media persons, Shivpal said that though he had offered a ticket to Mulayam from Mainpuri as Secular Morcha candidate but it would be entirely the SP patriarch’s decision.